Since a few days right near the front glass on one of the rocks a worm seems to have settled and started to build his sand tube. Recently then there was a lot activity also in two other places where I could observe how they are actually fishing for sand by casting out their seemingly sticky tentacles. Those tentacles are extremely long compared to the body size and once there is a few catches on the lines they reel them in to extend their housing. Very interesting to watch. I am very glad that they seem to be left alone and not even the Corkwing is nipping at them. The extension building process seems to be extremely slow. Lots of new shoots from previously bare rock or even the glass are coming since last few weeks. Nature seems to be feeling the longer days. Most of the shoots I think are Carragheen or similar. Also lots more Coral weed Corallina officinalis in various places which looks really nice and is very welcome. One new shoot is most intriguing, its a green and very fragile. To me it looks more like a hydroid as its branches are so fine and look more like feathers. It doesnt resemble any seaweed in my books or anything I have seen in pools so far. Its in a bad spot to capture but if it grows taller I might get a good shot. One of the anemones seems to have given birth to at least one tiny maybe 1.5mm diameter baby. It was floating through the tank and after everyone of the 3-spined Sticklebacks has had to check if its edible I felt sorry and scooped it out. Now its in the small tank where its at peace and has settled straight away. I hope its a strawberry anemone, it would explain the extremely odd behavior lately of not feeding and getting a bit smaller. Their mode of reproduction is still unknown but beadlet anemones are known to give birth to live young. Since the start of the tank in October I have only added 2 Snakelocks Anemones. At the moment there are 7! They are splitting a lot and its getting a bit much 😉 but its nice to see and I suppose a sign that they are comfortable. Last weekend I found bushy looking regrowing branches of Rainbow wrack. The near glow of the blue iridescence was very intense. Once in the tank it goes to a more greenish effect but still very nice. Its growing very well but again not as bushy as seen before. I do start to think that it is just the winter form of it and that it might get more bushy in the summer months. I am trying a lot of new red seaweeds to see can I get them growing but most of them are just hanging in there at the moment not dying off though. So will keep updating as I see progress. The beautiful Sea Oak is still looking well even though it was shredded by the powerheads when it came loose. My weird blobs (from the last post) on a piece of washed up seaweed where identified by the Porcupine Marine Natural History Society to my enormous delight to be the winter stage of the beautiful Sea Beech Delesseria sanguinea 🙂 So I definitely keep it and see if it grows come summer. 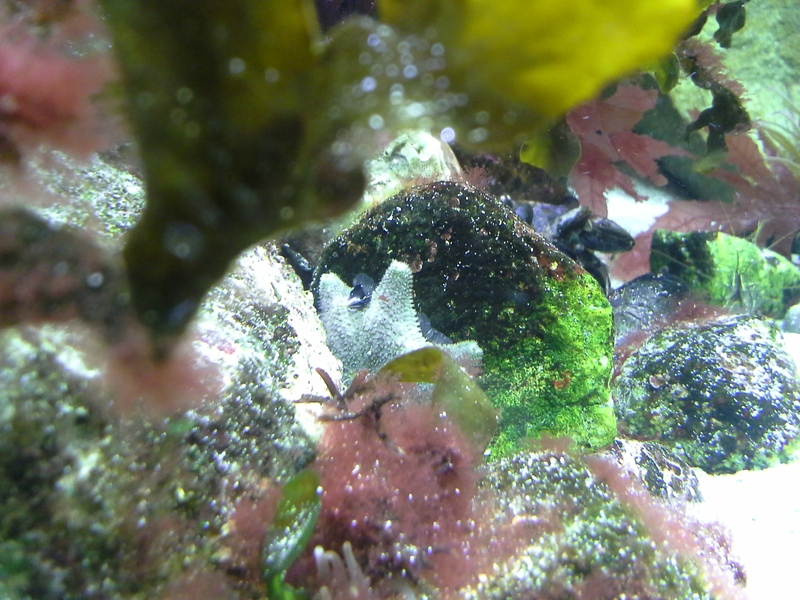 Finally one of the cushion stars was grazing close to the glass and I think the transparent tissue that can be seen between its arms is its stomach that it extends out of its body inverted on the rock to feed on the algae film. das mit den Delesseria-Winter-Kugeln ist ja unglaublich…noch nie gesehen und noch nie von gehört! Falls ich irgendwann wieder welche finde lass ich dich natuerlich wissen. Very interesting read, keep up the good work!